The penalties for non-compliance are reportedly astronomical. However, as GDPR affects everyone, from large multinationals to SMEs, it is unlikely that small businesses and organisations will be immediately affected — especially as even at this late stage (April 2018), new rules are still emerging. So our advice is don't panic, and don't rush it. It's more important to think it through. And we'll put our disclaimer right here: we are not lawyers. The purpose of this article is to give guidance but if you are unsure about anything, you must check the ICO website and/or seek legal advice. Does Applegreen Websites have one? Yes, it's here. 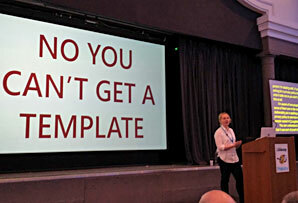 But one thing was made clear to us at a recent WordPress conference: you can't copy it. Every policy must be based on a business or organisation's unique circumstances. We attended several talks on GDPR at this conference and have distilled the information here, to help our clients and visitors. We are endebted to the speakers Toyin Agunbiade and Heather Burns and to the many writers and bloggers who have helped clarify points of detail. The GDPR builds on an existing EU directive that was passed into UK law as the Data Protection Act 1998. It aims to protect the rights of EU nationals wherever their data are stored, where transactions are conducted within the jurisdiction of the EU. GDPR will continue to apply after Brexit. To opt out of automatic decision making, for example, Netflix suggests programmes to watch based on those you have already seen, and you many not wish this. The days of automatic opt-ins are over: if you have a box which clients can tick to receive your newsletter when they buy from you, this box must be unticked by default. Ideally you must offer a double opt-in: an email is sent to the client to confirm they didn't tick the opt-in box by mistake. The 30-day response time is just that, a response time. You don't have to solve a particular request within 30 days, but you do have to respond to an enquirer within that time and give them a time frame within which you will have addressed their request. The main form of lawful basis is explicit consent. For example: a client signed up to your newsletter, on a given date. You may be asked to provide evidence of both the sign-up and the date. An alternative lawful basis, important for many website owners, is called implied contract: this is where someone has bought from you, and has given you their details so you can bill them, post to them or email them their purchase for download. Many newsletter lists come from this source, which is legitimate. Others include legal obligation (eg, an address for delivery of purchased products), vital interests (private information that can save a life), public task (data essential for performing public duties) and a looser category called legitimate interests. To argue legitimate interest you must identify the interest, show that data processing is necessary for it, and also show that you are balancing your interests against the interests, rights and freedoms of the person whose details you hold. For a full list and description of all the lawful bases for holding data, see the website of the Information Commissioner's Office. You may not collect any data at all: you still need to say so. But it's unlikely that you do not keep contact details for your clients somewhere, even if it's on pieces of paper. If so, you need to declare the fact. Where it is stored. Is it on your own computer? backed up to a cloud somehere? What steps you take to protect data from breaches, and what you will do in the case of a suspected breach. Date it, and make clear that is revisited regularly. You need to establish the likelihood and severity of the risk topeople's rights and freedoms. If it's likely that there will be a risk, you must notify the ICO within 72 hours, and the data subject immediately. If it's unlikely, don't report it but document and be willing to justify your decision. If your website is absolutely not to be used by children, you should require a declaration of age before entry. See a good example at Johnnie Walker. All WordPress installations are different. Nethertheless there is a GDPR core compliance project going on right now. In time, there will be a dedicated website with guidelines to help plugin writers, though Wordpress make it clear that no plugin can write your policy for you. WordPress will also add tools that will allow website admins to create user-friendly privacy notices. This will help generate a privacy page, but it will still be the admin's responsibility to review it.